Regardless if it's the Christmas lunch, intro trip or the local soccer tournament, we have made it easy for you as an organiser. Forget about complicated spreadsheets and time-consuming sale. With BilletFix you can do it all online - and it’s even free! Tell us your event name, date, ticket types and price and immediately start receiving money and collect signups from your attendees via a unique link. Optionally add more ticket types to accomodate for tickets at different prices. Your attendees signup on a unique page for the event in a matter of seconds and pay with MobilePay or credit card (if there is an admission fee). Share the link on your Facebook event, Facebook group or integrate the ticket sale directly in your website. Meanwhile, track the signups and update event details at anytime via your personal dashboard. On the day you'll have a complete list of all attendees who you can check in on a computer, tablet or smartphone. The attendees have received the ticket via email, which can be printed or displayed directly from a smartphone. 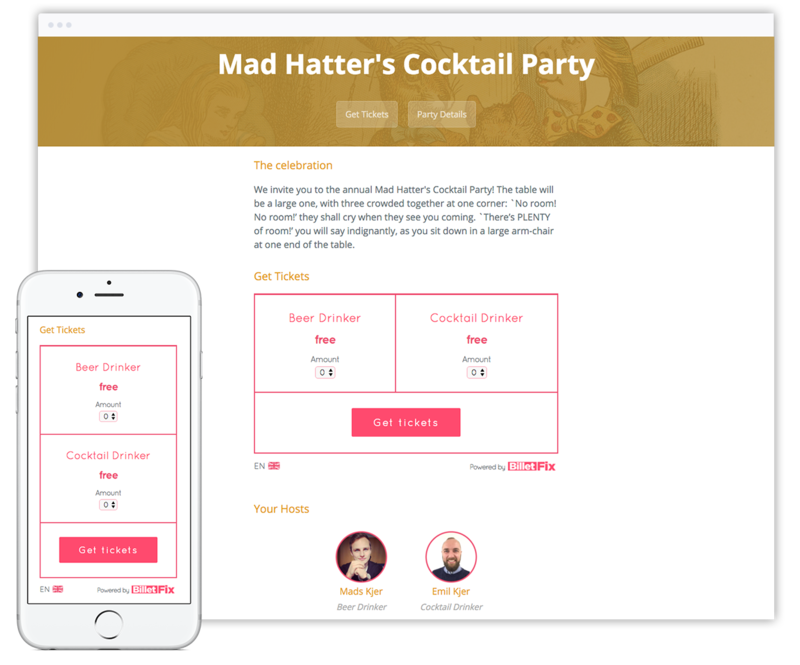 After the event, you’ll automatically receive an overview of the ticket sales and the money deposited to your bank account. 50% of our users pay with MobilePay. After the event has competed, your money is deposited directly into your bank account. It's as easy as copy & paste to start selling tickets on your own website - and it's free! Paste into your Facebook event, Facebook group, newsletter or a private email. Do you want to know something about your guests during their signup? Get all the information you would like with custom fields. Does any of your guests have food allergies? What field of study are your guests from? Is it the first time they are attending your event? As an organiser you can get information on all this and more. The cheapest signup system in the market! Do you want to give discounts to particular members of your organisation, or perhaps give out a few tickets for free? As an organiser, you can create coupons that provide a discount in the purchasing process. Follow the ticket sales and scan tickets at the event through the BilletFix app. Everything is in both English and Danish.